In this lesson, I’ll show you a few ways you can use keyboard shortcuts or navigation shortcuts to move sheets and navigate them. First, create a new workbook and add two additional worksheets. In order to switch between sheets, to the previous one you can use the following keyboard shortcut. 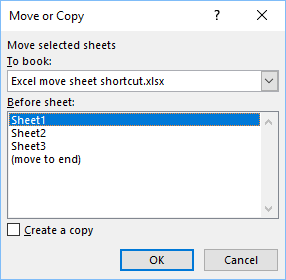 If you want to move to the next sheet, use this shortcut. If you reached the first worksheet, you can’t go to the last by pressing Ctrl + PgUp, and if you are on the last, you can’t go to the first one, by pressing Ctrl + PgDown. There is no standard keyboard shortcut to move or copy sheets, but you can use the Ribbon shortcuts. Press the following keys, one after another. This will activate Office access keys. Press m to open the Move or Copy window.